Pike Road Wines is in the press! Below you'll find all press and reviews for our wines in the media. OUR PINOT GRIS WINS GOLD! Our 2016 Willamette Valley Pinot Gris has been honored with a Gold Medal at the San Francisco Chronicle Wine Competition! The largest competition of American wines in the world names best American wines of 2018 After receiving 6,960 entries from 35 states across the country, the San Francisco Chronicle Wine Competition (SFCWC) has once again successfully narrowed thousands of wines down to an exclusive few. A complete listing of the 2018 results, sortable by price point and category, can be found at winejudging.com. In the second week of January, 67 skilled judges from a variety of fields including trade, education, media, retail and hospitality traveled to the Cloverdale Citrus Fairgrounds in Sonoma County to determine the best wines in the USA. 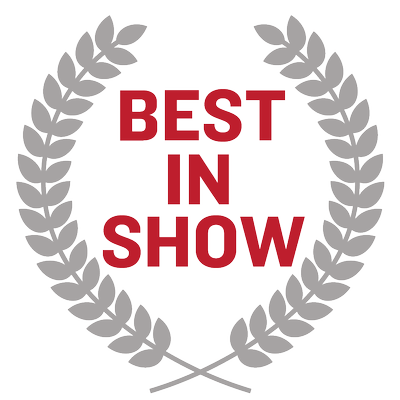 Utilizing an extensive process that divides the varietals into several categories and subcategories, the event gave the panels the chance to rate entries as Bronze, Silver, Gold or “Double Gold” (equivalent to a unanimous rating by all panel members). 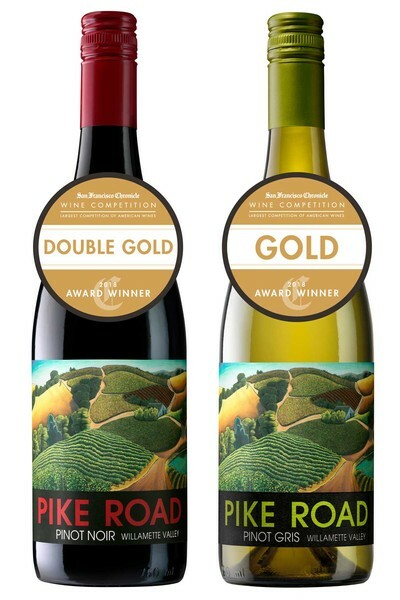 DOUBLE GOLD FOR OUR PINOT NOIR! Our 2015 Willamette Valley Pinot Noir has been honored with a Double Gold Medal at the San Francisco Chronicle Wine Competition! Pike Road attended the 2017 NW Food and Wine Festival, held at the Oregon Convention Center. We were excited to be a part of this great event for the second year in a row. "In its 12th year, the legendary Northwest Food and Wine Festival returns as the definitive wine festival in Portland with a targeted half-day wine and food celebration. The festival brings the highest quality regional wines, spirits, beers, foods and prominent chefs and restaurants. It’s designed to present a rich and rewarding experience for wine lovers, gourmet food enthusiasts and industry experts. For all involved, it offers a great opportunity for direct conversation." We hope to see you at the festival or at our tasting room in Carlton where you can try these medal winning wines. Cheers! #1 OUT OF 644 WINES TASTED BLIND!!! The Great Northwest Wine Competition brings together influential wine professionals from around the Northwest to taste over 600 wines blind at the beautiful Columbia Gorge Hotel. It is an honor just to be invited to submit our wines. Our 2016 Pike Road Pinot Gris won BEST IN SHOW at this prestigious competition, making it the top rated wine overall. We couldn’t be more proud of our winemakers. Check out the Great Northwest Wines Invitational results here! One of the top wine trends of 2017? What Sunset Magazine calls "Budget-Friendly Wines, Gold-Medal Quality"
Sunset reviewed our 2014 Willamette Valley Pinot Noir in their October 2017 issue: "Come-hither floral aromas lead to a palate of slightly smoky, spicy red-cherry and raspberry fruit. Medium-bodied, with taut tannins and zippy acidity." "It’s not hard to find a tasty $80 bottle of wine. But tasting blind to price, our judges found plenty to love for less than $25." "The wine showed a medium ruby color. Cherry, raspberry, cranberry, loamy earth, oak and whiffs of vanilla each arrived on the nose. Cherry, raspberry, currant, oak, mossy earth and hints of dried sage followed on the palate where the sage dissipated as the wine opened up. The wine exhibited good structure and length, along with well-integrated tannins. This wine would be a natural pair with grilled cedar plank salmon." "The wine showed a pale straw color. Tart apple, lime, chalk, hay and whiffs of lemon zest each arrived on a crisp and refreshing nose. Granny Smith apple, lime, hay and slate followed on the palate. The wine exhibited good acidity and balance, along with good structure and length. It would be an excellent aperitif and would pair well with steamed clams or grilled shrimp." We are pleased to announce that the 2014 Pike Road Pinot Noir won Gold at the 2017 Sunset Magazine International Wine Competition! Our 2015 Pinot Gris was also a winner, picking up a Silver. These wines continue to make us proud, and prove once again that great wines can be found at a great value. "Come hither floral aromas lead to a palate of slightly smoky, spicy red-cherry and raspberry fruit. Medium-bodied, with taut tannins and zippy acidity." The October 2017 "wine issue" of Sunset will feature this year's competition winners. But until then, check out behind the scenes footage of the judging process, plus a full list of the 2016 competition winners HERE. Top 50 Wines of 2016! Seattle Times publishes their Top 50 Regional Wines every year before Thanksgiving and we really couldn't have dreamed that our first vintage would make it to #13! This is a who's who of regional wines with an emphasis on the affordable, judged by Andy Perdue who is an expert on Northwest Wines. We really cannot express how pleased we are that the experts like our wine as much as we do! According to traveling wine bloggers, Kovas and Laima Palubinskas, Pike Road offers "eminently drinkable wines at a price point that allows for drinking more often than not." "dark ruby red; dark fruit, red berry and smoke aromas; plum, rhubarb, and pomegranate flavors; super pleasant mouthfeel with beautiful balance; nice acidic backbone..."
"floral, pear, and starfruit aromas; pear, vanilla, unripe lemon into a muskmelon finish; hint of acid keeps it fresh.."
50 States of Wine is a couple with a plan to visit a winery and craft brewery in each of the 50 states. Along the way, they'll visit restaurants, wineries, vineyards, and tasting rooms interviewing chefs, winemakers and growers, brewers, foodies, and more.